When I first moved into my apartment, I cooked meals from scratch every week. Then somewhere along the line I started buying TV dinners, and now my diet is 60% Lean Cuisine. I want to change that, so I'm challenging myself to try at least 40 new recipes this year. That's a little over three meals a month, which I think is easily doable even if I'm working most of the time. But this thread's not just for me. Feel free to join in this challenge too, and set your own personal goals to aim for. I'll bet a lot of you are secretly amazing chefs, and I'd love to see what you can do. Pat dry the tilapia fillets using a paper towel, then set them aside. Combine the paprika, onion powder, garlic powder, dried parsley flakes, salt, black pepper, and cayenne pepper in a bowl, and mix well. Spray cooking oil on both sides of each fillet, and then rub the paprika mixture on both sides. You should have enough of the mixture to liberally coat each one. Lay aluminum foil over a baking tray. Spray cooking oil over the foil and lay the fillets on top of it. Spray a bit of cooking oil over the top of each fillet. Sprinkle the fillets with fresh cilantro to taste, if you so desire. Man, what a great way to start this challenge off. I think this was the best fish I've ever made. Tilapia's cheap, so this is a very affordable meal, especially if you already have most of the seasonings. If you like food spicy, this is a great dish to try. If you don't like it too spicy, you could probably get away with reducing the paprika by a tablespoon or so. 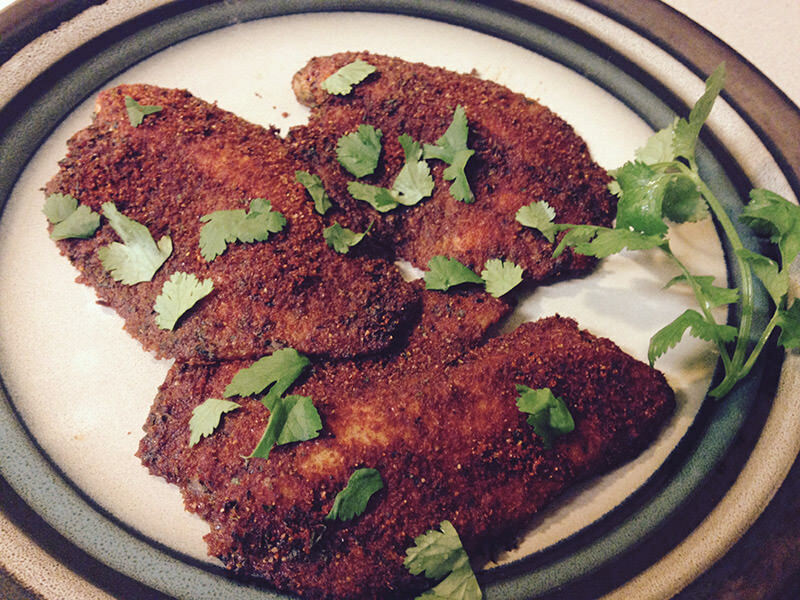 The recipe didn't call for it, but I went ahead and sprinkled some cilantro over the fillets, and it tasted great. I'll probably be trying this again sometime. I already try to cook from scratch as often as I can (this week is an exception...) but I definitely look forward to seeing what people try out and might post some recipes of my own! That looks so yummy!!! I'd love to have a go at this challenge... I work 40 hrs a wk, teach/volunteer at my church 4 days a week, so finding time to do this is going to be hard but I'll do my best! Ooh! And make-ahead meals. Do those when you have a lot of time, generate a lot of leftovers, ?? ?, profit! Gonna forward these to Jenocide for no reason. This will be a fun topic to watch but I mostly only eat cereal, sandwiches, and eggs. I cook 80%+ of all my meals from scratch due to necessity. Last week, I roasted turkey drumsticks (in butter with rosemary, parsley and pepper). I also made chicken paprika from scratch (chicken, paprika, chicken stock, pepper, cream and flour), and cooked a silverside the "old-fashioned" way (nutmeg, cloves, raw sugar, pepper and apple cider vinegar). They were each accompanied with either, various vegetables (Mashed potatoes, steamed broccoli, corn and carrots), or a salad (tomato, cos lettuce, raw carrot, cucumber, beetroot and corn kernels). I ate a lot of leftovers for lunches and even a few evening meals. My New Year's Resolution was to eat 4 rainbow meals a week, and I have managed to do this for the month of January so far!! Tonight, I'm planning pumpkin soup (we grew the pumpkin so I'm hoping for a taste sensation ) with bacon bits, nutmeg, parsley, vegetable stock, pepper, cream and a white roux. And you should know me well enough that I bake. A lot. Constantly. Cakes, biscuits, cookies, and slices. I was feeling ambitious, so I made a nice pork chop/homemade mash/sauerkraut dinner. Ate it in traditional Wisconsinite fashion (aka slice the chop up into cubes, then misch it all together into a pile and top with gravy--------------they call it a haystack). It was good. * This is the amount the recipe calls for, but I still had quite a bit leftover after using an entire one pound bag of pretzels. If you're not afraid of coming up short, I'd recommend cutting the amount for these ingredients by a third or even half. ** If you plan on fully dipping the pretzels, you'll need about 3 cups of chocolate chips. If you're only half-dipping them, 2 cups should be enough. Combine the softened butter and peanut butter in a bowl and mix on high. (If you don't have an electric mixer, grab a strong wooden mixing spoon and get ready for a nice workout). Add in the sugar and flour, mixing well until you're able to roll little balls of peanut butter in your hand without it sticking too much. Take a single pretzel, place a small dab of the peanut butter mixture onto it, and press a second pretzel down to make a little sandwich. Repeat until you've used up all of the pretzels. Refrigerate the pretzels for at least two hours, or overnight. 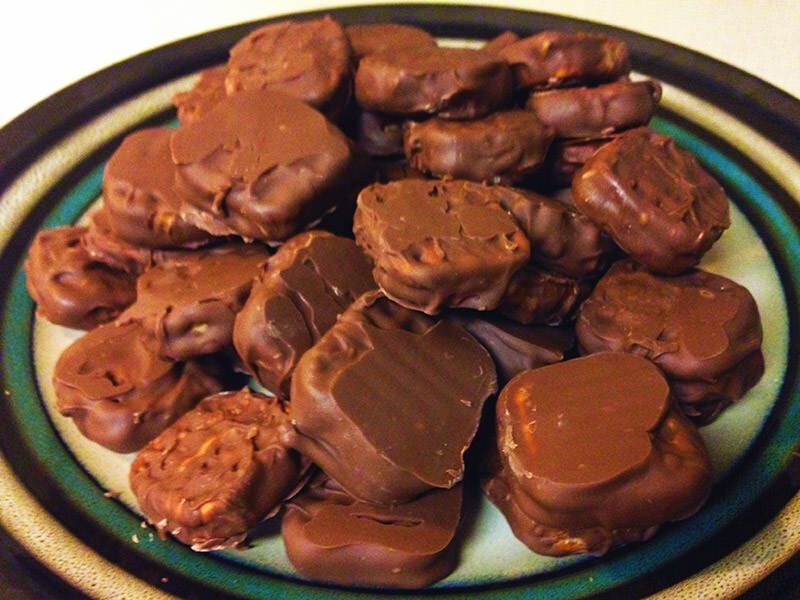 Dip each pretzel sandwich in the chocolate, either completely or only halfway depending on preference. (Chopsticks are handy for dipping, if you have them.) Place the dipped pretzels on a sheet of parchment paper. Refrigerate the dipped pretzels for about two hours, or until the chocolate hardens. Peanut butter is great. Chocolate is great. Pretzels are great. Bless the genius who realized you could combine all three. This one takes a while to make, but has a high yield, so you'll have plenty to eat all by yourself share with your friends and family. They taste frickin' great, too. Oh my gosh I LOVE THIS IDEA. I'm so bad at cooking for myself but I need to be better about it. You've inspired me; expect an addition from me soon. I fully expected this to be terrible given that it was my first attempt at a real recipe of any kind, but it came out amazing. I don't know if it was using plain yogurt instead of a beaten egg or accidentally cooking it in way too much vegetable oil, but the breading was much crispier than what I've had before. And that was with barely any tonkatsu sauce - I somehow didn't think to order more before making this. I also learned that boiling vegetable oil is hot and you shouldn't splash yourself with it. Whold've thought? ^Interesting, I've never thought to use yogurt as a binder instead of egg. -I didn't have enough rice, so I just cooked what I had and let that be enough. -I also had a pound and a half of meat, because that was the smallest package I could find. -Wegmans has pre-cut broccoli, so I used that because cutting up a whole head is for chumps. Anyone know of more vegetables that go well in chicken salad? Onion, celery, and parsley are all I can think of. I'm partial to spinach but i know it's not everyone's thing. I prepared an egg over medium and added onion, garlic, salt, pepper, parsley... put it on toasted bread with turkey, veggie cheese, and guacamole. It didn't come out too bad, pretty yummy and filling! Good idea, I always forget to really consider spinach because the soggy canned stuff comes to mind. So this objectively should have been a catastrophe, and it is only by sheer luck that I produced something edible. To start, the recipe called for onions and garlic, which I couldn't find at Target and simply ignored. It also wanted white wine vinegar, but I didn't want that and substituted lime juice per internet advice. Then it asked for four chicken breasts, but clearly was not expecting them to be as large as what they sell here. So I had to use triple the corn starch they called for in order to distribute it anywhere near evenly, and then couldn't stir at all because the chicken completely filled the skillet I had. I doubled the amount of oil since the requested one tablespoon was just a sad puddle next to the mountain of chicken, then sort of flailed at imitating stirring. Then I added the right amount of sugar, soy sauce, water, and lime juice despite using so much extra of the earlier ingredients for some reason, and only at that point realized I had no way of cooking it covered for that step. So I flailed at stirring some more, realized I couldn't measure out 1/8th of a teaspoon of cayenne pepper and just threw some on there, and stirred some more. The result probably cannot be considered Szcheuan chicken, but it's pretty good and, against all odds, somehow evenly cooked on the inside. Recipe, although you'd probably get something totally different from the above.